A commenter in a previous post left a reference to an oral communication by Aleksander Khokhlov – shared in a Russian forum on genetics – , from the XIV Conference on Samaran Archaeology, 27-28th January 2018 (still publicized in the Samaran Archaeological Society). NOTE. You may know Khokhlov as a palaeoanthropologist, part of the Samara Valley project, like David W. Anthony. 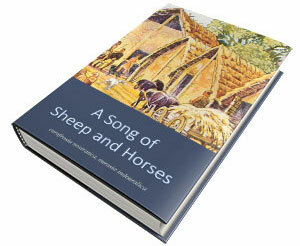 See the project referenced here, or their recently published book. Khokhlov, A.A. 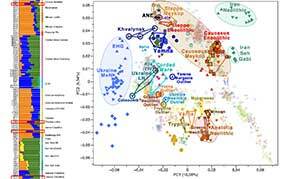 Preliminary results of anthropological and genetic studies of materials of the Volga-Ural region of the Neolithic-Early Bronze Age by an international group of scientists. In his report, A. 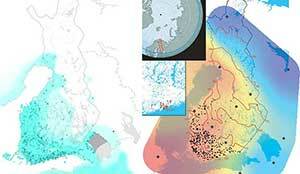 A. Khokhlov introduced the scientific circle to the still unpublished data of the new Eneolithic burial ground Yekaterinovskiy Cape, which combines both the Mariupol and Khvalynsk features, and is dated to the fourth quarter of the V millennium BC. All samples analyzed had a Uraloid anthropological type, the chromosome of all samples belonged to haplogroup R1b1a2 (R-P312/S116), and to haplogroup R1b1a1a2a1a1c2b2b1a2. mtDNA to haplogroups U2, U4, U5. 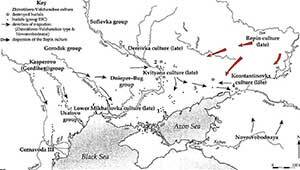 In the Khvalynsk burial grounds (first half of the IV millennium BC), the anthropological material differs in a greater variety. In addition to the Uraloid substratum, European wide-faced and southern European variants are recorded. To the samples are added haplogroup R1a1, O1a1, I2a2 to mtDNA T2a1b, H2a1. 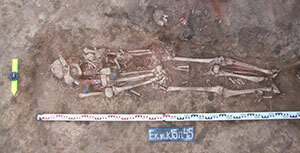 Yekaterinovskiy burial of male, 20-25 years old, dated ca. 4400-4200 BC. Via Pikabu. This is a reported summary of an oral communication, and it was written in a forum by a user. Unlike many out there, though, this one uses his real name, apparently assisted to the conference, and is himself a Russian of self-reported haplogroup R1a1a, so probably no interest in reporting this if it’s not true. Errors contained may have been made by him, and may not have been found in the original communication, since he says he wrote it by hand. Something is obviously off with the haplogroup nomenclature. There has recently been mixing of standards, with some papers reporting R1b1a2-M269 (which is supposed to be now ISOGG V88), and most using R1b1a1a2-M269. What I had never seen is both standards used at the same time, as in this report, so I guess it’s another error of transcription. It is doubtful that we would be talking about that recent referenced subclade of U106, but it can’t be a surprise to finally find L51 subclades alongside Z2103 in Proto-Indo-European territory. Also, the summary must obviously refer to Q1a1, not O1a1, and probably to the first half of the V (and not IV) millennium BC. NOTE. Since Khokhlov, like Anthony, is an anthropologist, and this is an archaeological conference, we could suppose – if the report is truthful to what he said or what could be read in the summary – that this is the best he can do to report genetic material that was not assessed by him, but by a specialized lab, because it is not his field. I think the relevant data is nevertheless useful until we have the official publication. Archaeological remains studied come from a site near Yekaterinovka. You can read more about it in The Ekaterinovsky cape – A new Eneolithic burial ground in the forest-steppe volga region (2013). 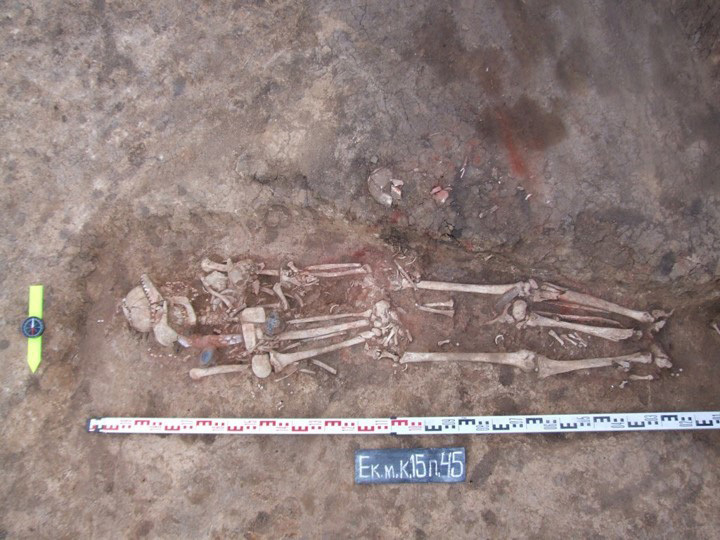 From this report of archaeological works, we know there were 60 Early Eneolithic burials excavated in 2013, dating to the period between S’yezzhe and Khvalynsk. 15 more burials were excavated in 2017, and there are to date already around 93 reported burials, with ongoing excavations. The presence of some samples uniformly of R1b-L23 subclades that early will mean an end to the question of when this haplogroup dominated over the Khvalynsk population, and probably also when it appeared (rather early during this culture’s formation), since it would mean R1b-L23 subclades were widespread already by the end of the 5th millenium. I can only guess that CHG ancestry will be found in these samples, based indirectly on what is reported in anthropological terms, and what appears later in Yamna and Afanasevo samples. 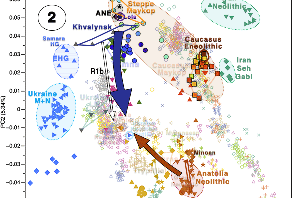 This will contradict some recent comments suggesting an admixture driven by males from the south, and especially a Maykop -> Khvalynsk migration as a source of this component, placing the admixture at earlier times, and/or driven by exogamy. Therefore we can reject the formation of Middle PIE outside of Khvalynsk, and also the expansion of Proto-Anatolian from Maykop (unless Maykop itself is proposed as a steppe offshoot). The presence of L51 lineages in certain clans side by side with others formed mainly by Z2103 in such a small region supports (as I proposed) the existence of early diverging LPIE communities – and therefore also the early splitting of a Northern and a Southern (i.e. 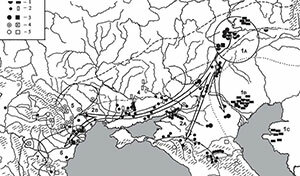 Graeco-Aryan) dialect, each associated with certain regional groups – already by this time, which may help with the identification of later migrants that ended in Afanasevo (and thus confirm the dialectal origin of Pre-Tocharian). It goes without saying that all those ideas of R1b-L51 stemming from North Pontic cultures, the Balkans, Central or Western Europe – unrelated to Khvalynsk or Yamna – should be rejected. Khvalynsk was probably dominated by R1b-L23 subclades already ca. 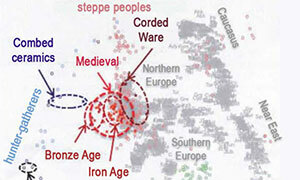 4250-4000 BC, which – combined with earlier, more diverse Eneolithic samples from the region (dated ca. 5000-4500 BC) – would support an expansion of these subclades just before this time, in the mid-5th millennium BC, as I proposed based on ancient samples and TMRCAs of modern haplogroups. 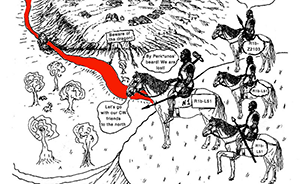 It is now more likely then that I was right in linking the expansion of R1b-M269 and early R1b-L23 lineages as chiefs with the spread of horse riding from early Khvalynsk, and thus associated also with the split and migration of the Proto-Anatolian community, probably with expanding Suvorovo-Novodanilovka chiefs. 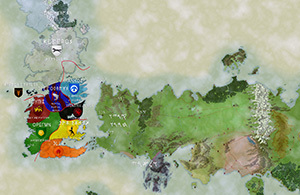 These findings should finally put an end to the idea of a shared “R1a-R1b Proto-Indo-European community”, by rejecting its existence already during the early Khvalynsk period, and therefore also rejecting the idea of a North Pontic Indo-Slavonic proto-language as impossible, since it would need a split 2,000 years before the known Late PIE expansions associated with Yamna, and 3,000 years before the formation of the early Indo-Iranian community in Sintashta-Andronovo. NOTE. While the presence of R1b-P312 and R1b-U106 subclades that early does not seem likely based on their estimated formation dates (in turn based on modern descendants), this is not the first time that such estimations have been proven wrong with ancient samples (viz. the “late” Z93 subclade from Eneolithic Ukraine sample I6561). Also, we already have one sample labelled U106 supposedly expanding with Indo-Iranians, and a sample of an early L51 subclade in Central Asia potentially linked to Afanasevo migrants in the infamous tables of Narasimhan et al. (2018), which help support its early presence in the North Caspian area. Some of these younger subclades seem (based on TMRCAs and forming dates of modern haplogroups) more like a wrong ‘excessive-subclade-reporting fest’, probably due to the use of a certain software for inferences of Y-SNP calls from scarce material, but who knows. 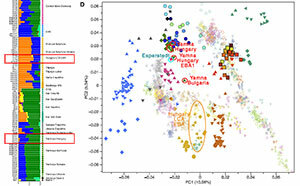 The publication of this and more data in a book is supposedly due for the summer, so let’s wait for the officially reported haplogroups, and for the corrected tables in Narasimhan et al. (2018), to draw the necessary detailed conclusions. This post was emailed to subscribers of this blog on the 1st of May immediately after publication, with our Newsletter. If you want to keep up to date with the latest interesting information instantly (few mails will be submitted a month, if any), subscribe now. EDIT (May 2017) The answer I received from the group to my questions regarding these samples can be read here.